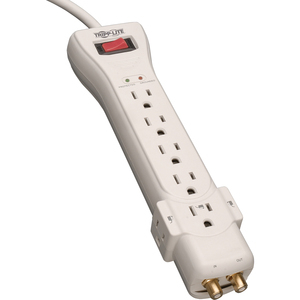 The SUPER7COAX surge suppressor from Tripp Lite has 7 outlets and a 7-ft. cord with a space-saving right-angle plug. The unit has 2160 joules of surge energy absorption to handle the strongest surges. Built-in coax jacks prevent surges from damaging your cable/satellite equipment. Diagnostic LEDs alert the user to potential power problems. $75,000 Ultimate Lifetime Insurance (USA & Canada Only). No warranty cards required for coverage! Audio/visual devices, cable television connections, home theater systems, personal computers, CAD/CAM/CAE workstations, network nodes, fileservers and point-of-sale terminals.